Django for UW presented on November 3rd, 2011 which goes through the creation of a Django project. Django Docs - One thing Django is known for, it is excellent documentation. You can access overviews, reference and the tutorial from this one landing page. B-List - When it comes to Django James Bennett has a lot wisdom. Check out this entry on dynamic forms for example. It is well worth reading his older entries. Simon Willison's Blog - One of the creators of Django. jacobian.org - Blog posts and other resources from Jacob Kaplan-Moss one of the other creators of Django. Django community aggregator - Blog posts from all over the Django community. Beware there is some noise as well as signal. Cal Henderson often referenced and incredibly entertaining keynote. Most the issues he raises in this talk were addressed by Django 1.2, but it is still a great talk! 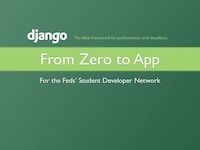 The best practices for how to make apps reusable have evolved since this 2008 video, but James Bennett view of the world is still a good evolution over the impression you are left after going through the Django tutorial. Simon Willison's interesting presentation of cowboy development including a section about /dev/fort which is one of the major inspirations for Wilderness Labs. A old pre 1.0 talk about Django given by Jacob Kaplan-Moss as a Google Tech Talk. Things have changed but it still very interesting form a historical perspective. Jacob Kaplan-Moss talking about deployment on a higher level than some of the workshops which follow this. The only slightly out of date 3 hour long practical Django deployment workshop hosted by Jacob Kaplan-Moss. You can also checkout his configuration scripts on github. Next up is a 3 part, 2 hour talk about Django deployment which features James Bennett and Jacob Kaplan-Moss. Is is more out of date, but is interesting from a historical perspective. Another Google Tech Talk by Jacob Kaplan-Moss looking into the history of how Django was developed right from revision 1. Guido van Rossum excellent talk on Python 3 (Python 3000). Support for Python 3 should be coming for Django in the next 2 years or so. Alex Martelli on Python itself in two parts. A good way to learn some of the subtleties of the language and grow your confidence.